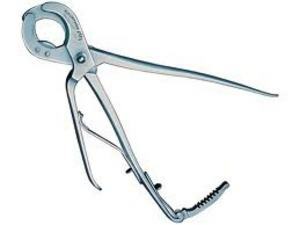 A Safer Technique for Equine Castration. Castration is one of the most common surgical procedures performed on the horse. Although horses can be castrated at any time the most common age is between 12 and 18 months. Castration can be performed in various ways depending on the age of the horse, cooperation and tractability of the horse, time of year, and conditions in which the horse lives. Castration can be performed through an open incision (Figure 1) which is left open to heal or a closed incision using a scrotal ablation technique. 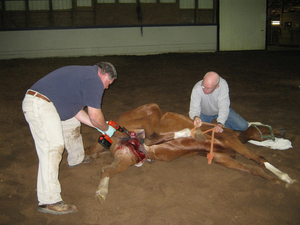 Routine castration is performed using an emasculator (Figure 2) which crushes the cord to control hemorrhage. 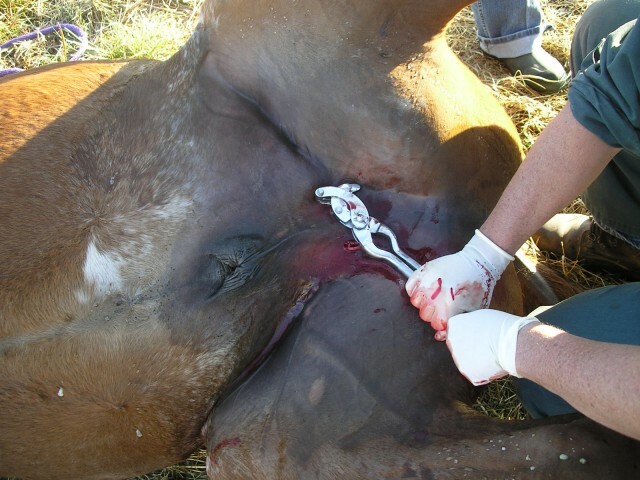 Another instrument we employ at CK Equine Hospital is the Henderson Castration Device (Figure 3). This instrument uses a drill to twist the cord which allows the blood vessels to be occluded (Figure 4). 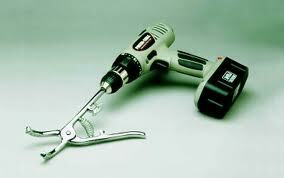 Regardless of which instrument is used the incision is left open to heal on its own. Typically horses are left alone and observed in their stall for 24 hours followed by twice daily exercise. After 10-14 days they can return to normal activity. Some hemorrhage from the incision is normal for the first 12-24 hours. The incisions will swell and drain until they are closed and healed. Premature closure of the incisions can lead to excessive preputial swelling and infection. A safer technique that we like to perform at CK Equine Hospital is the castration with scrotal ablation. The incisions are closed with multiple layers of absorbable suture. By using this technique there is no drainage, minimal swelling, and quicker return to activity. After 7-14 days the horse can return to normal activity. The costs associated with scrotal ablation are more than with traditional castration. However, we feel that the postoperative outcome for you and your horse are improved. By performing a castration with scrotal ablation, we decrease the swelling, decrease the drainage, decrease the time to complete healing of the incisions, and most importantly; significantly decrease the chance of excessive internal hemorrhage. To have a castration with scrotal ablation performed at CK Equine Hospital does require general anesthesia and hospitalization. In addition, your horse will receive antibiotics and anti-inflammatories before and after surgery. Usually the horse will be observed overnight to insure no immediate complications and then discharged the following day.